A tongue and groove ceiling will run along the same lines as the beam and is often seen in a vaulted ceiling. Available in many designs, most commonly known as “rustic” feel, the costs will often be much more than a traditional drywalled ceiling or drop ceiling due to the material being used. The costs of a tongue and groove ceiling will depend on various factors, including the contractor you hire, the materials you chose (the biggest factor), the complexity of your ceiling (height/width and obstacles, for example) and your geographical region. With so many factors in play, it can be hard to offer an exact price, however, based on the quotes we researched online, your quote should be within the $4.50 to $8.50 per square range, with most of the price being applied to the wood material, if you were to hire a contractor. This price would not include the costs of refinishing the wood if need be. Browse the materials at Home Depot, for example, to see what popular boards, for the material alone, will cost. As it is very difficult to offer an “exact” price, you can get one if you use HomeAdvisor.com. With this free, no-obligation tool, you can input your project information, and with this, licensed contractors in your area can contact you with quotes. It’s free to use and no credit card is required. According to this BobVila.com article, the author claimed he paid $1,450 for the tongue-and-groove boards only and another $1,400 for the labor. For his project, it took three days for both the carpenter and his helper to complete the work. On this FineHomeBuilding.com forum thread, a member asked about the average costs of a tongue and groove ceiling, with one member, in particular, responding that it really depends on your market and if it’s finished or unfinished. For unfinished boards, you could be closer to $3~ per square foot, but for finished boards, the costs could be almost double this. We did mention the Home Depot link above, but you can also check out prices at AdvantageLumber.com as well to see what the boards may cost. As mentioned, the costs per linear foot can vary depending on the size, the type of wood and where you purchase it from. Glancing at this list, we did notice the averages, based on the factors mentioned, could range from 42 to more than $6+ per linear foot for just the materials. When being installed, it’s much easier to lift the ceiling planks individually as it will weigh much less than a sheet of drywall. Compared to drywall, a tongue and groove ceiling creates a focal point in the room, creating an attractive and sometimes rustic look homeowners are looking for. As you can cut the boards to size, it can be installed in virtually any situation. In the future or even at the time of the install, it can be difficult to paint. When compared to drywall, it isn’t as soundproof as you want it to be. The installation time is often much slower when compared to drywall, often increasing the labor costs if hiring a carpenter. If you were to compare the prices to drywall, you’re probably going to pay at least 50% more on average. 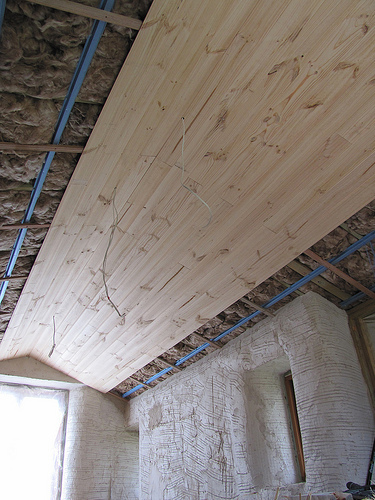 Most tongue and groove ceiling will be made of either 1×6 or 1×8 spruce, according to FamilyHandyman.com, but other options are available as special sizes and types can be special ordered. Some boards, for instance, can be rough on one face and smooth on the other. Tongue and groove boards are known to shrink and expand as the humidity and temperatures lower and rise. Because of this, unfinished boards installed during the summer months can look much different in the winter months if your area experiences drastic temperature swings. As this wood dries out and shrinks, unfinished stripes will begin to show where the tongues withdraw from its grooves. However, all of this can be avoided if you apply a finish before installation to avoid this look. The DIY Network has a simple how-to guide on how to install the ceiling if you want to do the job yourself or are curious as to how the process works.